OS SHP Builder 3.37 has been released!, It's time to spread the word! Almost six years after the last official release, Open Source SHP Builder 3.37 is now available for download at Project Perfect Mod. This version adds features such as Mirror, Flip, a new Resize method, an auto-installer/update/uninstaller to make the distribution of the beta versions easier and fixes several bugs reported by the community. 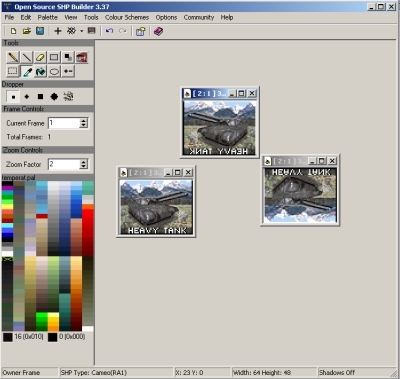 OS SHP Builder has became a reliable tool to edit graphics from Tiberian Dawn, Red Alert 1, Tiberian Sun, Red Alert 2 and also OpenRA. - Added: Mirror and Flip: You can mirror and flip frames at Tools -> Image Rotation. - Added: You may now enable or disable the preview of brush operations at View -> Preview Brush. It is enabled by default. - Added: You may now enable or disable the ability of the program of auto-detecting SHP type, game and palette at Options -> AutoSelect SHP Type. It is enabled by default. - Added: MS Paint resize mode at Edit -> Resize. It resizes the image using windows API, like what MS Paint does. - Added: A new option at Preferences that lets you save shadow frames using compression 1 to prevent issues with big sized units and animations. - Added: Installer is now inside the program. This means that any beta version of OS SHP Builder will come with an installer that will always download you the latest version of the program. You must be connected to the internet to use it. - Added: Auto Update at the Help menu. It will always download you the latest version of the program straight from the SVN. You must be connected to the internet to use it. - Added: Uninstaller is also inside the program and in a separate link. - Updated: The default settings now forces different palettes for each situation instead of unittem.pal for everyone.  - Updated: The program will use your theme now. - Bug Fix: Images with dimensions bigger than 500 pixel may now be resized. - Bug Fix: Zoom will no longer go out of bounds. It will always be between 1 and 32. - Bug Fix: Palette Conversion no longer mess up with colours at the remappable range if it is not an unit. I recommend everyone to update your OS SHP Builder for this version. You can download it HERE. Support for this tool is available at HERE.